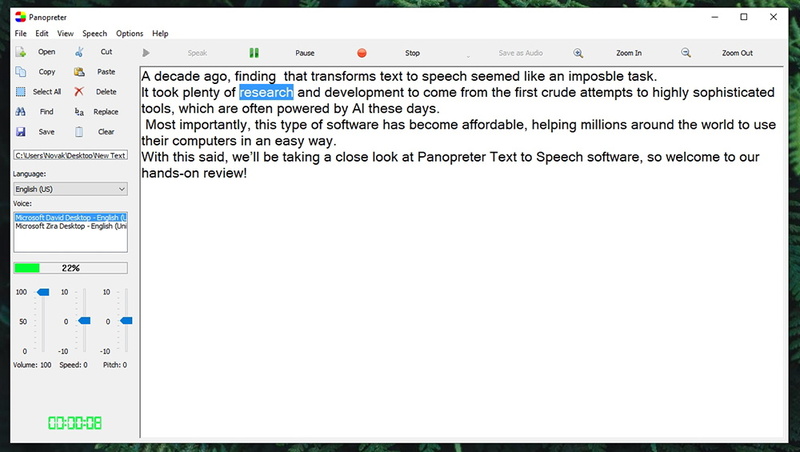 Panopreter Text-to-Speech Software Review – Reads & Transforms Into Audio Any Type of Text! 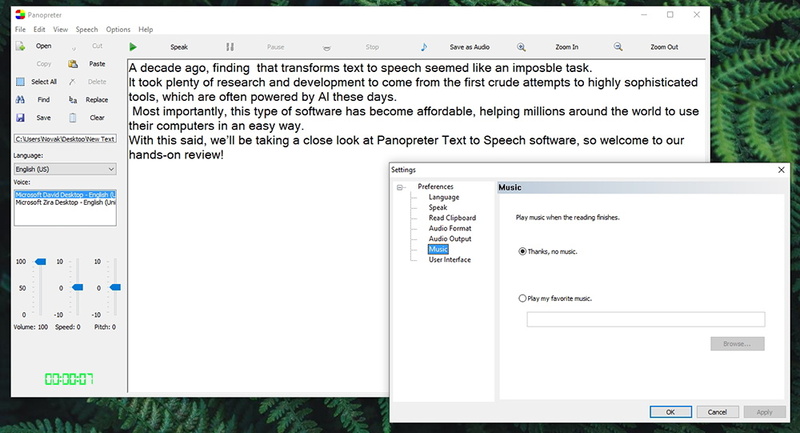 A decade ago, finding software that transforms text to speech seemed like an impossible task. It took plenty of research and development to come from the first crude attempts to highly sophisticated tools, which are often powered by AI these days. Most importantly, this type of software has become affordable, helping millions around the world to use their computers in an easy way. 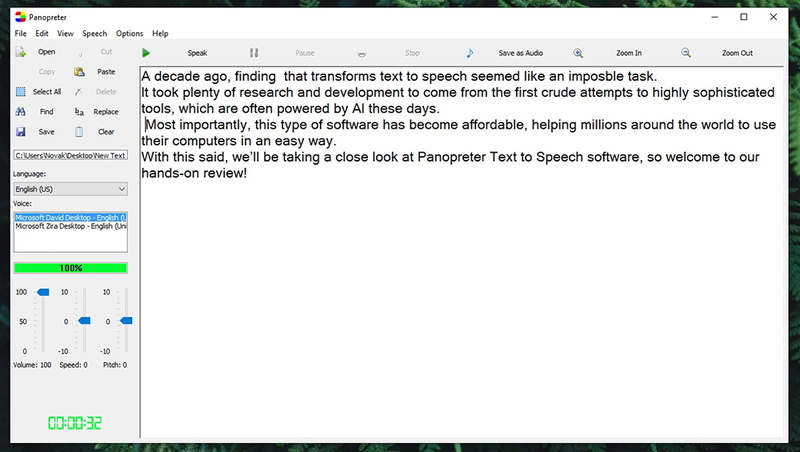 With this said, we’ll be taking a close look at Panopreter Text to Speech software, so welcome to our hands-on review! Panopreter is a simple application, and some might even call it basic. However, plenty could be said about this text-to-speech solution, and we’ll begin by providing some of its highlights. Take a look at the following table. Windows 2000, XP, Vista, 7, 8 (8.1), and 10. Supports various text-based formats; Batch file conversion; Transfers text files to MP3 and WAV formats; Integration with Internet Explorer and Microsoft Word. We fully understand that some of you might be in a rush. If you don’t have the time to read this entire review, we have another table for you. What follows is our final verdict of Panopreter, after spending quite some time testing the application. Easy to install and use; Supports various text document formats; Exports text into audio files; Supports many languages; Audio fine-tuning available. Despite its rudimentary UI, Panopreter shows a lot of promise. 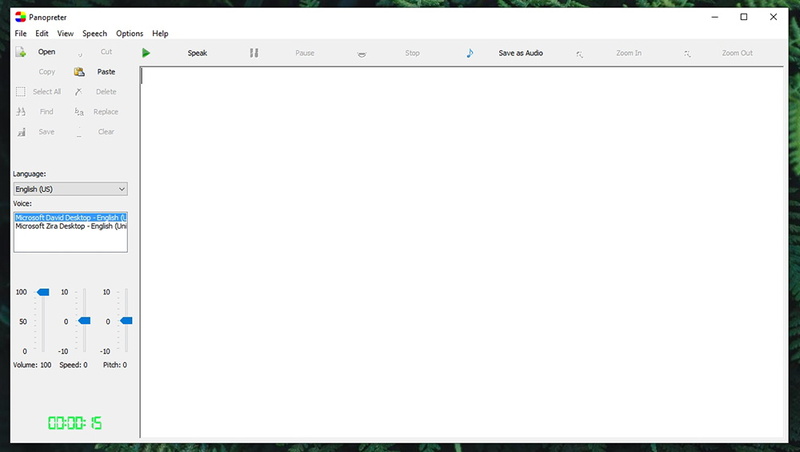 It easy transfers any type of text into speech, and even gives you the ability to save audio files. Highly recommended! Finally, we are ready to dive into everything this software has to offer. If you stick with us until the end of this article, you’ll get to learn everything there is to know about Panopreter. Before we continue, we’d like to let you know that we’ve tested the latest available version of Panopreter (3.3.4.5). More precisely, we’ve used its 32-bit version on a Windows 10 PC. And now, here’s our full review. Panopreter is compatible with Windows only (2000 to Windows 10). Strangely, it also integrates with Internet Explorer and older versions of Microsoft Word. Our Score: 5/10. Panopreter offers both 32-bit and 64-bit applications. However, things aren’t as simple as you might want them to be. That’s because Panopreter doesn’t offer a 64-bit version for Windows 10, which is definitely a surprising fact. 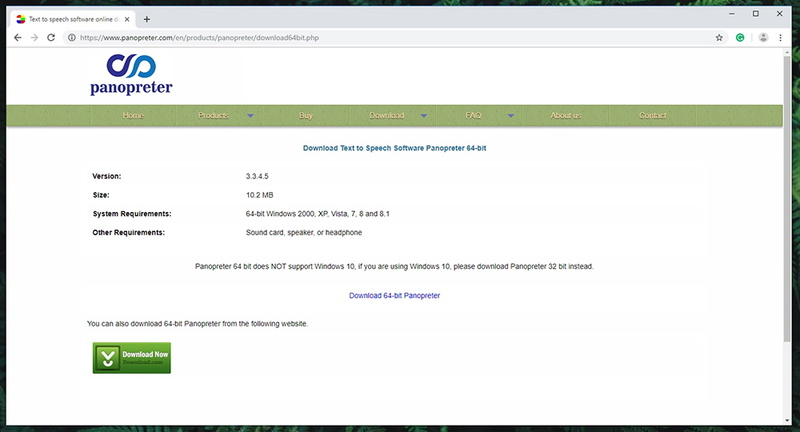 So, if you’re using a 64-bit version Windows 2000, XP, Vista, 7, or 8 (including 8.1) – you can take advantage of the 64-bit version of Panopreter. In case you’re using a 32-bit Windows 2000, XP, Vista, 7, 8, 8.1, and Windows 10 – you’ll need to go for its 32-bit version. Also, please note that this application isn’t available on any other platforms. We also need to highlight that Panopreter comes with a toolbar for Internet Explorer (which might be a strange decision considering that Internet Explorer is now obsolete) and Microsoft Word. Please note that the software isn’t compatible with the ‘docx’ file format. Instead, with works with ‘doc’ files only. 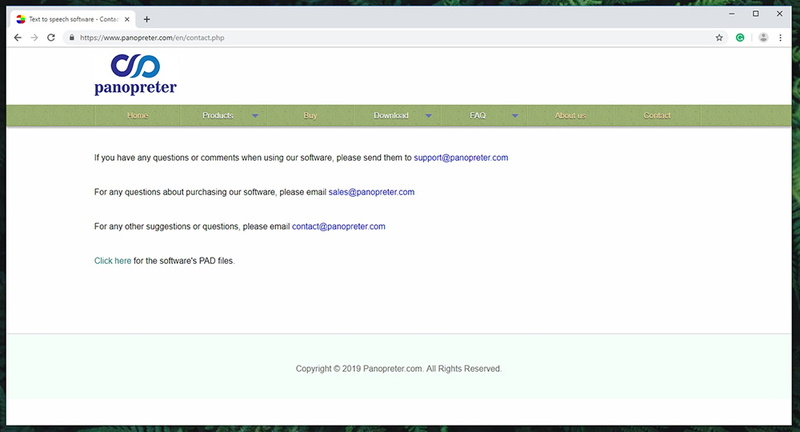 To get started, you can download the latest available version of Panopreter from its official website. You can either purchase it directly, or you can test-drive the software for up to 30 days. Once downloaded, click on the installation file. Choose the installation directory, and that’s pretty much it. The last step is to open the software, which can be done via the Installation Wizard (just before you close it). Panopreter is very easy to use. You don’t need to have any prior experience with text-to-speech applications. Plus, it comes with tons of useful features. Our Score: 8/10. Once you launch this application, you’ll be greeted by somewhat rudimentary UI. However, it comes without any complications, and it’s easy to use. We’ll explain all the features you can expect by giving you a guided tour of its UI, so let’s get started. The Home Screen of Panopreter gives you all the tools you need to get started. On the left side, you’ll see a wide sidebar with a bunch of buttons at the top. This is where you can open text files and then edit the text once it’s inside the application. You can copy, cut, paste, selected, delete, and replace portions of text just like in old-fashioned text editors. Panopreter works with the following file types: TXT, RTF, PDF, DOC, HTM, HTML, and MHT. Once you open a text file, the text contained within the document will be recognized by the application. This is when you can start playing it, which is done via the top-placed toolbar. Here, you’ll find buttons to start playing (speaking), pause, and stop. You can also zoom in and out and save your file as an audio file (WAV and MP3). One of the biggest advantages of the Panopreter Text to Speech Software is that it doesn’t only work with English. There’s a sizeable list of languages that you can choose from the left-placed sidebar. Then, you can also choose from different voices, and even adjust the volume, speed, and pitch. We believe this gives you plenty of freedom to fine-tune everything to your liking. To check out some behind-the-scenes features and to fine-tune the software, you need to open its Settings panel. It’s located under the ‘Options’ item at the top of the screen, and here’s what it offers. Language: In case your OS is in English, you can instruct Panopreter not to use this language by default. Instead, you can select another language, which will be set as the default one each time the application opens. Speak: You can set the application to highlight words as it reads them, process XML tags, read file name before reading its content, and more. Read Clipboard: You don’t have to use the application’s UI each time you want something to be read aloud. Instead, Panopreter can read the text that you paste on the Windows clipboard. Audio Format & Output: These two sidebar items let you pick the preferred audio format and you can choose where to save audio files by default. Music: If you want, the application can start playing music files once the reading finishes. User Interface: Since Panopreter is all about making it easy to use a computer, it comes with a nice set of UI adjustments. All in all, this application doesn’t have the most polished UI out there. However, we believe that it works well. It doesn’t have any distractions and comes with intuitive controls. You can review self-help material and you can send an email to the company’s representatives. Either way, your questions will be answered. Our Score: 10/10. There’s no need to worry if you ever get stuck, and Panopreter comes with helpful customer support channels. Here are all the ways you can have your questions answered. In-App Help: By going to Help > Help Contents, you’ll find a series of nicely written guides on how to use the application, what some of its features can do, and more. Frequently Asked Questions: There’s a surprisingly comprehensive section dedicated to frequently asked questions. You will find general questions here, as well as how to use this application with Internet Explorer, Microsoft Word, and more. Email Contact: You can also send an email directly to this company’s support team. You’ll find a dedicated ‘Contact Us’ page with email addresses of different departments. This isn’t a huge company, so you can expect a reply in a timely manner. This application comes priced at $29.95 for a single computer. There’s a 30-day trial as well, letting you test the software with no limitations. Our Score: 10/10. If you think that Panopreter can be a good solution for you, there’s a 30-day trial available. This means that you can download the software and use it with no limitations during the trial. And if you decide to purchase it, you’ll get to buy Panopreter for $29.95. Once you get a license, you can use it on a single computer. Also, please note that this is a lifetime license that applies to minor updates only. In case there’s a version 4.0 of Panopreter in the future, you’ll need a new license. However, this doesn’t stop you from using the latest available version for your license in the future, with no restrictions. 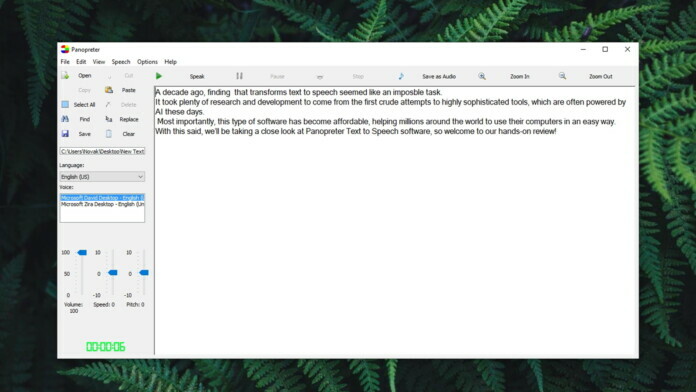 Do We Recommend Panopreter Text-to-Speech? Panopreter does have some limitations – but we still strongly recommend it. If you need a Windows application that’s easy to use, reads different types of documents online, and even saves that as audio files, we’re sure you’ll be more than happy with this choice. PROS: Very easy to use; Imports a number of different text documents; Integrates with Word; Transforms text into audio files; Support for various languages; One-time purchase. CONS: Limited to Windows; Somewhat outdated UI; Doesn’t support modern Web browsers. OUR SCORE: 8.3 out of 10! With everything said so far, we think that Panopreter is worth giving a try. If you feel the same way, don’t hesitate and buy Panopreter today. And if you become a user, make sure to share your experience with us via our comments section below. Since you’ve made it to the end of this article, wouldn’t it be fair to share it online as well? And don’t forget that you can follow us on Facebook and Twitter as well. Thanks! Despite its outdated UI, Panopreter is an incredibly powerful solution for reading any type of text. It comes with plenty of interesting features, does its job quite well, and most importantly - comes at an affordable price.